One thing&apos;s for sure: Nike&apos;s Hyperfuse technology is here to stay, as it&apos;s used on nearly ever modern performance sneaker with a Swoosh. Somehow, Nike keeps finding ways to update the construction, making things lighter, cooler, and more efficient for each specific sport. The KD V continues this trend, introducing a new Hyperfuse upper with fewer layers and a webbed lacing system. This allows the upper to be lighter and more flexible, as well as creating a better fit and reducing pressure from the laces. Mesh panels have also been inserted right above the midsole, to help ventilate the wearer&apos;s foot in the area where heat and sweat build up the most. 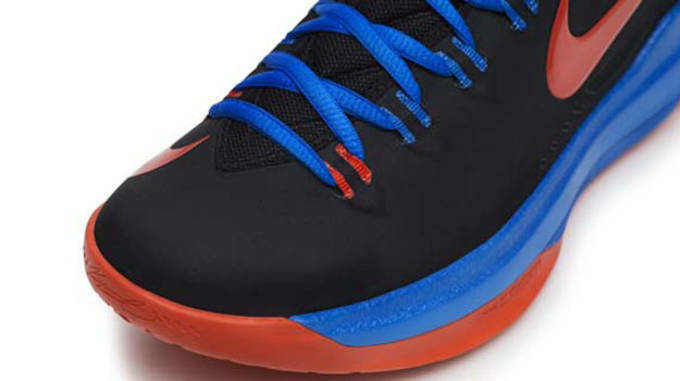 The outsole of the KD V is unique in a number of ways, but most impressive is its functionality. A thin "web" is used for the outsole in place of the bulkier molds used previously, which increases flexibility and reduces weight. There&apos;s just no need to clunk around on the court in outdated 90&apos;s kicks or sneakers with boot-like traction, so upgrade your game this weekend. The forward positions, especially small forward, can be some of the most demanding in the game. It requires the ability to balance the quick, momentum-filled style of guards with the dominant, powerful style of bigger players. Without the proper footwear, it can really be taxing on a player to play through big minute games. Nike&apos;s designers realized this, and implemented a cushioning setup that hadn&apos;t been used yet in the KD line. 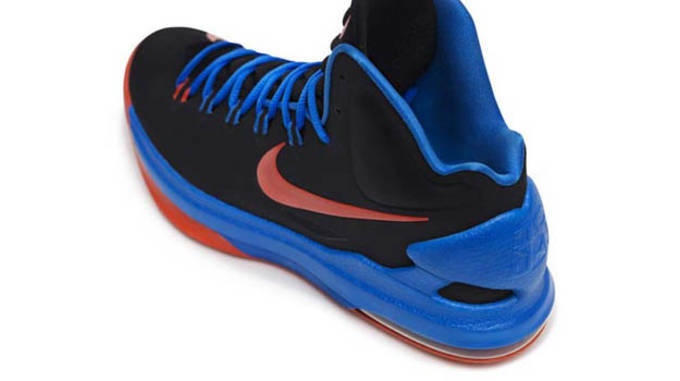 Influenced by Durant&apos;s request for a visible air bag, the KD V features a Max Air unit in the heel, as well as the standard forefoot Zoom Air seen in his previous signature shoes. 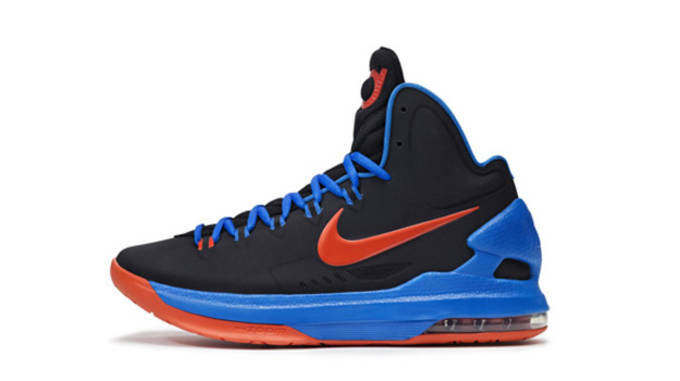 The forefoot Adaptive Fit strap from the KD IV seemed to be a love/hate affair for many, with opinions split across the board. 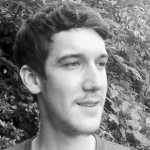 For the V, the designers took a new approach, literally beginning from the opposite point of the sneaker. 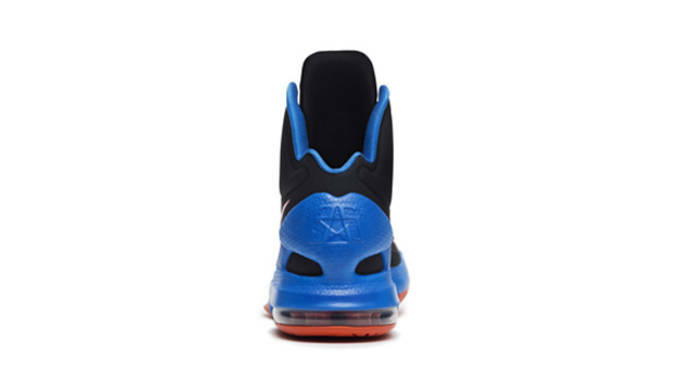 The external heel counter on the KD V has actually been integrated with the midsole, creating what appears and feels to be a one-piece wrap. This allows for a proper fit, and you definitely won&apos;t have to worry about any heel slippage with these. Although the concept of fusing the heel cup with the midsole is relatively new, it offers an unparalleled level of stability and protection. In case you needed a reminder, Kevin Durant has been the league leader in points per game for the past three NBA seasons. Although his Oklahoma City Thunder fell short in the NBA Finals to LeBron & Co., there&apos;s simply no denying that Durant is one of the premiere players in the league. The superstar has always made a point to keep his signature kicks affordable, and the KD V will keep the trend going, retailing at $115. Not only are you able to lace up the exact same footwear as the man who is arguably the greatest player in the game, but they won&apos;t cost you nearly as much as some of the other basketball options on the market.